Our first meeting was convened as a teleconference using the Zoom.US service on October 26, 2017 at 11am Eastern / 8am Pacific. 1. Determine what content is needed on the wiki. Ideally we have a master list of articles needed or maybe a list of broad themes (like Terraforming) which articles can be written within. 2. The process for assigning out & approving new content. Nicole had the idea of an Editorial calendar with shifts, so that there is always an editor on call to review new submissions. 3. How the editorial subcommittee can keep momentum, either through regular weekly working sessions or some of type of Slack-like tool. 4. How do we Redesign the home page to add some graphics and make it easy for new volunteers to plug in quickly. Susan asked how can people know about the Council or this subcommittee by going to Marspedia, because there is no mention yet on the home page or About page. James Burk responded Yes, we need to think about the home page holistically and what content / news updates we want to put there. The current news updates are very old. (After the meeting, James Burk added a line to the https://marspedia.org/Marspedia:About page linking to the Council section to partially address this.) During the meeting, James reported that he had created the Council section of the site to comply with the Sunlight clause in the Council bylaws and that everything there was ready for public consumption. James Burk shared details of the conversation he had the night before with Nicole Willet (Mars Society Education Director & a member of our Council), since Nicole wasn't going to be able to attend this meeting. Nicole previously worked on some content which was meant for a space/Mars encyclopedia which was never published (the publisher cancelled the project). She spent some significant time on the articles, and she would like to contribute this work to Marspedia, but not if it is going to be public domain; she would still like some attribution since she spent so much time on it, and it's book-quality. Some discussion of the other wikis, which have come up repeatedly in meetings but as we have no charter or oversight of the other wikis, there is nothing we can decide for them -- which James Burk reminded everybody about. None of us are opposed to helping the other wikis long-term but want to focus first on this one since Marspedia is where everybody has shared interest / purpose. Susan mentioned we should have a disclaimer that states our way of licensing doesn’t necessarily apply to the other wikis. We discussed the overall state of the wiki’s content licenses, as the main area (namespace) is explicitly tagged as public domain (no rights) but there are sub-areas (other namespaces) set up with other (old) licenses. James Gholston suggested we could just tag individual articles with a specific content license, and James Burk mentioned that he had done something similar with the Mars 2020 article (tagging it as CC-BY-SA 3.0 since it was from Wikipedia.) There was no objection to this approach of tagging individual articles with a license different from the main namespace and this seems like the easiest and simplest solution for the moment. At some point we will need to go back and clean up the other namespaces since they have older licenses and were seldom used. James Gholston mentioned that if we are going to pull content from Wikipedia, we also have to pull the article's history from there, to satisfy the attribution requirements. Just linking to the history on Wikipedia is not good enough. James Gholston pointed out the “Needed Articles” link in the left navigation, which goes to the “List of Lists” page, which is an index pointing to other pages that list missing articles. He suggested this can be a starting point for a list of needed articles. James Burk suggested we rename “List of Lists” to “Needed Articles” to better describe this. James Burk & James Gholston both mentioned adding to this list. “We can go ‘Hog Wild’ adding more needed articles here.” – Burk. 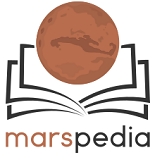 James Burk suggested creating a master list of topics to cover all aspects of Mars so that additional gaps of needed articles can be identified. For example, there was no article for Mars 2020 mission until recently. Kerri Miller suggested we take off “List of” for each link and that we prioritize this list. Susan Martin suggested we create a Teacher landing page to point teachers to some of the non-technical articles (like Nicole’s work, and she could be attributed prominently there). We could also have a teacher module on the home page with a call to action for Teachers -- would you like to write for us? James Burk expanded on this by saying that once we have a good stable of content, it would be great to have different Custom Landing Pages that link to the various articles in different ways. There were no objections to these ideas. James Burk relayed the suggestion from Nicole for having an editorial calendar, where people could sign up for shifts, and anything submitted during your shift, you are the first person to review & edit. Because of the nature of a wiki, initial submissions will already be live, but we can go back and quickly review and edit with this process. James Burk volunteered to set up a Google Calendar for this, as he recently did for MDRS Capcoms. Mike Delaney suggested someone needs to drive it & make sure people are actually doing it, which James Burk also volunteered to do. We talked about should we assign out articles directively or just wait until people work on articles from Needed Articles page that they are interested in. James Gholston said that we should do both, and shouldn’t prevent people from working on anything. No objections to this idea. We’ll beef up the “Needed Articles” page and identify some “priority” articles that need to be written (“core” topics), then invite people to look at the priority needs first when determining what to write about. Susan mentioned she is actively soliciting Science journalists to assist us and this should help provide direction on what they can work on, and what is needed. We talked about how articles can show up on the Category:Maintenance page using templates (Category:Tag Templates). Some work needed by Technical Subcommittee to clean these up to have a clear set that can be used to mark an article as needed maintenance, and being consistent in their use across the existing articles. Cleanup needed here as many articles are currently mis-tagged. Susan wants to make the home page more user-friendly, especially for non-technical people. Also make it more accessible for young STEM-learners. We also need to think about our left navigation and the top navigation on the main page. Need a UX designer or other web design expert to look at the website’s visual appeal, ease of use, etc. Caveat: Mike Delaney said it can be quite challenging to make any changes to the look/templates because hard to get the CSS to line up. Also want to make it more mobile-friendly. Mike Delaney suggested adding functionality to the home page so that modules can “collapse” (sometimes called “Drawers” in the web design field). Some discussion of the skin / theme used for Marspedia, which Susan tabled after awhile. The Technical Subcommittee needs to do some work to upgrade the skin used by Marspedia to “Vector” (or a custom “Vector”) from the current “Monobook” as a prerequisite for doing anything with the homepage. This issue referred to the Technical Subcommittee for now. We all agreed that Slack plus a weekly telecon (for now, might be less frequent in the future) is the best way to maintain momentum. James Burk offered to set up a new dedicated Slack for Marspedia Editorial subcommittee, instead of using the existing Moon Society or Mars Society ITF. Reason being – we going to have a lot of new editorial volunteers, and we don’t want them to get confused by adding them to existing Slacks. It will be good for them to login and be dropped right into the #general channel where all the work is being done. We will meet next week, potentially at the same time, but will look at options using the When2Meet tool. Mike Delaney in particular cannot make this time next week. From Kerri Miller: It occurred to me at the very end of the call that the "stubs" page could be a good place to start. We can add more stubs for articles that need to be written and mark key topics on the list (perhaps with an asterisk) that we'd like people to consider first when deciding what articles to write (and explain the asterisk in a red box at the top of the stubs page). That way, the article is already established, which will eliminate a step for potential contributors. This page was last edited on 26 October 2017, at 18:23.